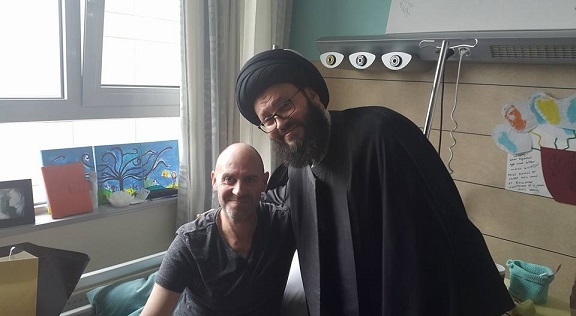 • الموضوع : Cleric Mohamad Ali El-Husseini during his visit to the wounded people of Brussels bombings: Terrorism does not represent anyone but himself and its committers, so terrorism should be limited to its perpetrators; and we address the victims of the terrorist . 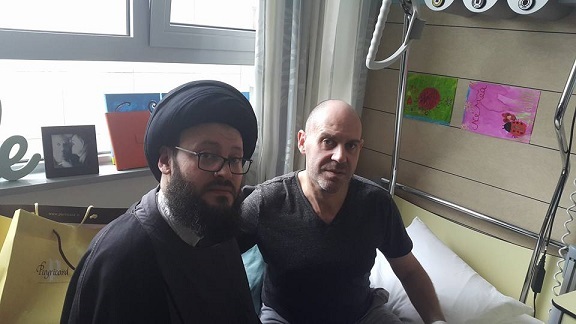 Cleric Mr. Mohamad Ali El-Husseini, Secretary-General of the Arab Islamic Council in Lebanon, visited Azat Jet Hospital in Brussels where he met with the wounded and the injured people of Brussels’ terrorist bombings, including the wounded Wal Tagah who was injured in his feet and lost one leg. Mr. El-Husseini denounced the acts of violence in all its forms, noting that "terrorism does not represent anyone but itself and the perpetrator must therefore be limited to terrorism committers." El-Husseini conveyed to the wounded people that "your wound and injury is ours” and concluded by saying that: “your redemption day of the inevitable death is blessing fate and a message and responsibility you have to lead." • كتاب: مصادر الشريعة الإسلامية. تأليف:السيد محمد علي الحسيني" اللبناني".